The terms ‘warm-blooded’ and ‘cold-blooded’ are used for simplicity throughout this essay. In fact these terms are something of an over-simplification. Virtually all animals, if examined at the proper time, will appear to be ‘warm-blooded’ – i.e. their internal body temperatures will be about the same. What’s more important is the mechanism by which body temperature is maintained (thermoregulation). Here’s a quick science lesson, like you may learn in a university science course or earlier. The terms endothermic and ectothermic are relevant here. An ectothermic animal relies on heat from the outside i.e. the environment, to maintain body temperature, whereas an endothermic animal relies on heat generated within its own body by metabolic processes, and will therefore have a higher metabolic rate. There are even more precise technical terms for processes intermediate between full endothermy and full ectothermy which will not be discussed here. Once it was thought that all dinosaurs were cold-blooded. Now many suggest that at least some were warm-blooded, which would help to explain why they became so plentiful and dominant for so long. If we examine today’s fauna, we find no large land predators that are cold-blooded, except for crocodiles that occupy only one very specific ecological niche and are basically water dwellers. The same is true of the entire Cenozoic era. Virtually all large predators were warm-blooded. The reason is not difficult to find. The position of top predator is a very competitive one. The ability to control body temperature and maintain it at a constant value (i.e. warm-blooded) is a very large advantage. Not only does it mean that the animal is not dependent on the environmental temperature but can hunt at any time of the day (or night), or in any season, but it also means operating at maximum efficiency. All creatures, whether warm- or cold-blooded, use the same basic biochemical processes to produce energy, with the same enzymes and substrates. The chemical reactions involved generally have a particular optimal temperature. For every drop of 10 degrees C, the process will be twice as slow. Hence, the sluggishness of cold-blooded animals in cold environments or at night. Evolutionary theory thus demands that, in any long term competitive situation, warm-blooded animals will always win over their cold-blooded competitors, and this is what the history of mammal development demonstrates. No large cold-blooded predators can develop against mammalian competition. Instead, they remain small and occupy ecologically specialized positions where they can hide for most of the time and only need to hunt for food occasionally when safe to do so. There are, of course, attendant disadvantages to endothermy, not the least of which is the need for very much larger expenditure of energy to maintain elevated metabolic rates, and a commensurate increase in food requirements. Given that mammals have such an enormous advantage, what are we to make of the Mesozoic era when, for 140 million years, dinosaurs reigned supreme and few mammals grew larger than a chicken. Mammals and dinosaurs evolved together. Dinosaur ancestors (thecodonts, particularly ornithosuchians) and mammal ancestors (therapsids, particularly cynodonts) were in direct competition in the late Triassic, with the therapsids initially appearing to have the upper hand. However, by the end of the Triassic the thecodonts were on top, dinosaurs assumed the roles of top predator and large herbivore, and all other roles down to the very small, which they left to the mammals and other reptiles. How did they manage to take over in the first place, and then keep the mammals subservient for so long if mammals had such a potent evolutionary advantage in being warm-blooded? The logical answer, of course, is that dinosaurs had to be warm-blooded as well! For those who believe that dinosaurs are just large reptiles this is an unacceptable view. Given that all we have left are lifeless bones and footprints, is it possible to produce evidence in support of the warm-blooded dinosaur hypothesis? Surprisingly, perhaps, the answer is yes, although such evidence must be largely inferential. The question is yet to be decided, but on balance the likely outcome seems to be heavily weighted in favour of at least partially warm-blooded dinosaurs. The tests for endothermy have also been applied to the mammal ancestors (the therapsids: cynodonts, dicynodonts) and thecodont dinosaur ancestors. In both cases the results suggest that they were more like warm-blooded than cold-blooded animals, and that endothermy may have developed in both lines at an early period (late Permian ?). In this scenario, dinosaurs would simply be one group in a line of succession of warm-blooded animals. What does seem clear is that dinosaur physiology was different, and may even have been different in different types of dinosaurs. We can never know the answer by direct measurement, and as long as we are forced to rely on analogy we will probably never reach a consensus on this controversial topic. Endothermy is not an either/or proposition, as the large number of potential physiological mechanisms involved make a wide range of alternatives possible. The large size range of dinosaurs alone probably means that they did not all share a common physiology, nor use the same strategies and mechanisms to reach a particular physiological state. Comments Off on Were Dinosaurs Warm-Blooded? 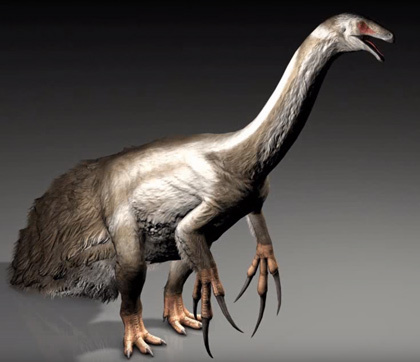 The word “bizarre” is often used to describe dinosaurs, but Therizinosaurus is bizarre by even dinosaur standards. It has the long neck, small head and tiny, leaf-shaped teeth of a sauropod. However, it isn’t a sauropod but a theropod. Yet, unlike other theropods, it was a plant-eater! This dinosaur had other strange features, including a broad potbelly and incredibly long finger claws. Most paleontologists believe Therizinosaurus was the reptilian analog of the giant (extinct) ground sloth, and those huge claws were probably used to pull down leafy branches close to its mouth. BERI’S DINOSAUR WORLD Presenting the Art of Berislav Krzic. Another interesting art site. Beri has some very nice images, also talks about how artists do their work (a nice source of info for those wanting to know more about this). Beri is also adding other links and info as time goes on. With many of the images are facts and information about the dinosaurs Beri draws. Makes this another good information site about the specific dinosaurs he has done in his art work. Dinosaur Murals by Beverly Leesman. Watercolor artist Beverly Leesman who for the last fifteen years, Leesman has devoted her talents to the exploration of realistic watercolor based on her own photographs has now expanded into some dinosaur art in a mural that she is making for the Birthday Party Room at Gold Cup Gymnastics. Other than the famous Peabody Mural have not seen too many murals lately. Chris Srnka , an illustrator living in Columbus, Ohio. He is a graduate of the Columbus College of Art and Design. He will do a wide variety of freelance work, but dinosaurs are by far his favorite subjects. He currently designs billboards in Columbus, along with the freelance work. The dinosaur images were first sketched on paper, then scanned into his computer. He used Metacreation’s Painter 5.0 to paint the dinos. Painter emulates traditional media, allowing for a wide range of tools and styles. Although the art is digital, it is all hand drawn, using Painter and a pressure-sensitive drawing pad. Dinosaur Illustrations. Online collection of dinosaur art. This site’s purpose is to help you locate great illustrations of dinosaurs that have been posted on the Internet. It is intended as a shortcut from going site to site hoping to find the specific dinosaur your looking for. This searchable index contains more than 150 links to books and image galleries of and about dinosaurs. Each link connects you to a short description of the source of the art and a thumbnail image linked to a larger version of a pertinent image. The Dinosauricon – Dinosaur Art. One of the better dinosaur information sites I have found. It still has one of the best collection of art I have yet seen in one place online that I am aware of. Authored and maintained by T. Michael Keesey this one should be in your bookmarks! Doug Holgate. Douglas Holgate describes himself as a budding dinosaur illustrator fresh out of a post graduate degree in Illustration at Newcastle University, Australia. His major study in this year was the reconstruction and illustration of Australian dinosaurs and flying reptiles. Jim Robins: Jim Robins has worked on a wide range of graphic art projects, but dinosaurs and other ancient beasts have always been a speciality. His work has appeared in numerous books and magazines, on television and in exhibitions worldwide. All his pictures are protected by copyright. They can only be reproduced with permission from the artist. Joe Tucciarone’s Art Pages. Joe has some very excellent art. Joe Tucciarone is an artist whose subjects range from distant galaxies to the long-vanished dinosaurs. 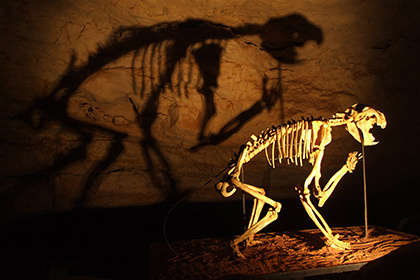 Visit one of his prehistoric animal galleries where you’ll see over fifty paintings depicting many of the best-known prehistoric beasts that have ever lived. The illustrations are accompanied by information about each animal including its physical size and weight, the geologic period during which it lived, the year it was discovered, and its diet. 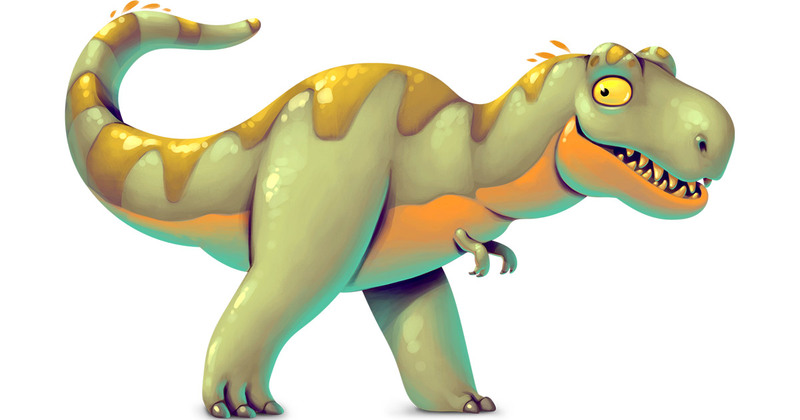 JORDAN MALLON’S Paleoportfolio This website is devoted to the science and art of dinosaurs. It will be constantly updated as new illustrations and information are added. Illustrations & Information: Presented on the following pages, in alphabetical order, are a host of dinosaurian species. Each of these species is fully illustrated and accompanied by significant and up-to-date information. Luis Rey, Site contains a number of dinosaur works by Luis (as well as other work of his). These are some nice artworks. Check them out. I especially love some of his recent work with the feathered dinosaurs! JOHN SIBBICK DINOBASE, a dinosaur web-site of the University of Bristol, hosts a page featuring a large collection of illustrations by England’s premier paleolife artist, John Sibbick who specialises in restorations of dinosaurs and other prehistoric scenes, and his work has appeared in numerous books and magazines, on television and in exhibitions worldwide. All his pictures are protected by copyright. They can only be reproduced with permission from the artist. Michael William Skrepnick is an established, award winning artist specializing in visual interpretations of dinosaurs and other extinct Mesozoic vertebrates within their natural environments. He also focuses on restorations and reconstructions of newly described dinosaurs with many of the world’s leading paleontologists and on imagery of popular dinosaurs for publication in books and magazines, museum murals, scientific journals and television documentaries. Michael works primarily in acrylic paint, as well as graphite and pen and ink. Original artworks are owned and housed in a number of public and private collections around the world. Michael lives and works in Alberta, Canada, close to some of the richest North American, Upper Cretaceous dinosaur fossil deposits in the world. Paleo-Illustration By Frank DeNota. Another very excellent collection of images by the artist Frank DeNota.. I encourage you to check out his artwork! Troodon Productions Inc. Dinosaur Story Books The combined talents of Phil Currie (Tyrell Museum), Jan Sovak (Illustrator), and Eric Felber create factual based story books that give you a glimpse into the ancient world of dinosaurs. Click here to see samples of some of Jan’s art! The Raptor’s Lair. More images of dinosaurs catering to those of raptors, sketches done by Sharon Mossy (a.k.a. Velociraptor or just Raptor.). The Age of Reptiles Mural at the Yale Peabody Museum. The vivid scene reproduced from Rudolph Zallinger’s famous dinosaur mural The Age of Reptiles, overlooking the Great Hall in Yale’s Peabody Museum, is far more than a magnificent work of art. It is also a scientific document transforming the knowledge, ideas, and thoughts of many scholars of ancient life into realistic and accurate images. The mural is one of the largest in the world, measuring 110 feet long by 16 feet high, and required more than four and a half years (1943-1947) to complete. It is at once a motion picture and a time machine, a menagerie and a botanical garden that portrays an almost unimaginable chapter of earth history spanning more than 300 million years. The animals and plants of this panorama — most never having been seen by human eyes — have been resurrected for our contemplation and wonderment. Here, the textbook names take on new meaning; our mind’s eye perceives the reality and magnificence of unfamiliar plants and communities of astonishing animals. Dinosaur Art and Modeling. 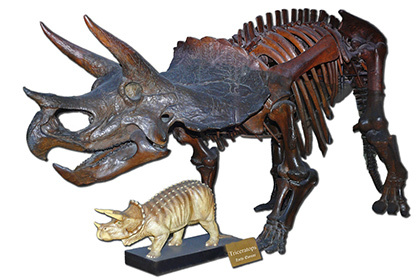 This site provides graphics and information, as well as sources for paleoart, sculpture, and model kits. We routinely present review of recent works, as they become available. Dino-More. Check out the work of Michael Monfils. He produces natural history sculpture, models and artwork for museum display and the private collector. Although dinosaurs are his particular field of interest and research, he can also produce sculptures and models of other natural history subjects, from insects to fish to amphibians to reptiles to birds and mammals. Dino-Store currently offering a full line of Dinosaur Skeletons, Dinosaur Skulls, Dinosaur Finished Models, Dinosaur Pewter Models, Dinosaur Keychains, Dinosaur Pens, Dinosaur Magnets and Dinosaur Art. These amazing items are done with an extreme amount of detail and being offered at affordable prices. Click on Dino Store and check them out. Lost World Studios. Lost World Studios is proud to present the most realistic dinosaur exhibits ever assembled! Lost World Studios is a company specializing in the construction and fabrication of prehistoric exhibits and related subjects. They have worked actively with fossil materials from around the world for more than 30 years. This experience has given them a special insight into the world of prehistoric animals and their environments. Whether you need a permanent or temporary display, Lost World Studios can bring the excitement of the prehistoric world to your institution. The owner, Guy Darrough is a self-taught and highly accomplished paleontologist, fossil preparation expert, and illustrator who has worked in paleontology and related areas for 40 years. His technical and artistic skills in fossil preparation meet the highest museum standards. Specimens from his own exceptional collection are routinely loaned to museums for exhibition and for scientific studies. Guy’s accomplishments include amassing a premiere collection of Missouri fossils, making significant discoveries in Paleontology (including the discovery of a wide variety of Cambrian and lower Ordovician fossil animals previously unknown to paleontologists). MEGALANIA DINOSAUR MODELING PAGES Models of dinosaurs and other prehistoric animals in resin, vinyl, styrene, or whatever other material the manufacturer can conjure up! MENAGERIE PRODUCTIONS The dinosaur sculptures of San Francisco resident Tony McVey are viewable through the courtesy of Larry Dunn’s Megalania Review Page, along with Larry’s glowing commentary about them and the address for McVey’s Menagerie Productions. Paleogarden. 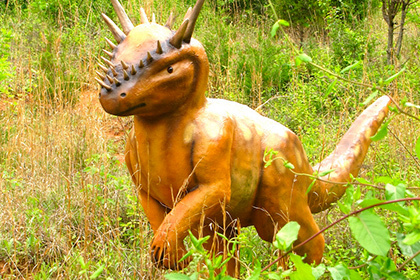 Paleogarden specializes in life-size anatomically correct 3D dinosaur reconstruction, and other ancient life sculpture. All our work is of the highest museum quality. We offer customized commission pieces to suit any budget, with everything from static resin castings, bronze, partially animated to fully bio-mechanically animated flesh restorations. We also have an expanding catalogue of material available for sale. Our in depth knowledge of evolutionary interrelationships and comparative anatomy ensure our pieces are the most accurate available. All of our dinosaur reconstructions are produced in close consultation with prominent paleontologists. Raymond Persinger. Raymond was one of the first sculptors hired by Dinamation. During his time at Dinamation he personally sculpted and/or directred teams in the creation of more than 70 dinosaurs. These range in size from small scale models to a 50 foot T-rex. His work has been exhibited in museums around the world including the Smithsonian in Washington D.C. He was personally selected by National Geographic to sculpt a static flying Pteranodon for their permanent collection. Besides serving in an artistic capacity Raymond’s abilities as an inventive problem solver proved to be an invaluable asset to Dinamation. He helped develop robotics, inovative mold making and production techniques, create exhibits and interfaces with museums and the public as a field service specialist. Ray would be interested in creating work for museums and/or working directly with paleontologists in developing sculptural representations of their finds/theories.Check out his website and see examples of his work. There is also information on contacting Ray for your own museum exhibits and displays. Because of Raymond’s numerous accomplishments, Dinamation’s VP’s often referred to him as the “Merlin of Dinamation” and Science Director Robert Bakker stated that Dinamation would never have existed were it not for Raymond’s many contributions. Some very great work, I have seen many of the robotic dinosaurs at Fruita (at the former Dinamation museum, now Dinosaur Journey – Museum of Western Colorado)in past few years and other places. Some very nice work. Watson Sculptures & Models A site where some nice bronze sculptures of dinosaurs by Doug Watson can be seen. Doug has worked for the National museums of Canada for 17 years, the last 12 exclusively for the Canadian Museum of Nature as a Model & Diorama specialist. Since 1981 he has also produced bronze sculptures, mainly of wildlife for sale to the public. Current dinosaur art includes a 1:24th scale and is 7.5″H x 19″L x 5″W Tyrannosaurus rex, and two new sculptures a 1:24th scale Triceratops and a 1:12th scale Utahraptor ostrommaysi. Dinosaur FotoImages. Photographic images of dinosaurs in “natural looking” settings. Check them out. These images are for your personal use, enjoyment and education. They may not be used for any commercial purpose including publication or redistribution for commercial gain. Dinosaur Studio website is a showcase for the accurate, science-based dinosaur sculpture and products of noted paleoartist Dan LoRusso. With nearly a decade’s experience in the field of paleo-reconstruction, The Dinosaur Studio is respected worldwide as a supplier of realistic dinosaur sculpture to collectors and museums; clients include The Royal Tyrrell Museum of Paleontology, Museo del Ricon Colorado, and Dinamation International. Dinotreker. Within this site you will find a very unique and interesting view of dinosaurs and Paleo art. Featuring a showcase of dinosaurs and dinosaur art from some of the best Paleo Artists in the world today. Paper Dinosaurs, 1824-1969. An Exhibition of Original Publications From the Collections of the Linda Hall Library The Linda Hall Library is now presenting an exhibition of original printed materials related to the history of dinosaur discovery. On view are most of the classic papers of dinosaur lore, including the original publications of Gideon Mantell, Richard Owen, Othniel Marsh, and a host of others. The focus of the exhibition is on images, both of discovery and of restoration. The exhibition runs from October 17, 1996 through April 30, 1997. What follows is a hypertext catalog of the exhibition. It proceeds through all forty-nine items of the exhibition, but includes links to thirty-five more works that could not be accommodated in the exhibition hall. There are 136 original images. Prehistoric Times a publication for the Dinosaur collector and enthusiast. Its focus is primarily dinosaur/prehistoric animal collectibles, many articles involve paleo science and artwork of the highest scientific accuracy. “PT” is probably ‘lighter’ reading than most most locations on this site but I’m sure many would enjoy it. Artists like Donna Braginetz, Mark Hallett, James Gurney and more are highly involved with PT and they will be running interviews with paleontologists from time to time. PT is a magazine sold in stores and through subscription but people arriving at this site can see our beautiful full color covers and a table of contents for each issue. The Dinosaur Project Just for fun, and since they have always been fascinated by Dinosaurs, M. Richard Associates Inc. decided to send their graphics and animation guys back to the Mesozoic. And this website was the result. This interesting site focuses on the animation of dinosaurs. Check it out! Dinosaurs from Patagonia will take the viewers back to a 3D journey in the Patagonian region. Dinosaurs are amongst the most fascinating animals to have ever walked the Earth. We are captivated by their enormous size and intrigued by the fact that they disappeared millions of years ago. Dinosaurs from Patagonia 3D will take audiences on an unprecedented and unique 3D journey into the world of the largest known dinosaurs and, in the process, explore some of the great paleontological discoveries of modern time.Done in close collaboration with the foremost scientists of the domain, the movie will show never seen before computer generated footage of the Giganotosaurus and the Argentinosaurus to name a few. Gaston Design. Gaston Design has been producing highest-quality dinosaur fossil replicas for more than 20 years. We’re located in Fruita, Colorado, in the heart of the American Southwest’s famous Dinosaur Triangle. All of our casts are expertly designed and crafted, using state-of-the-art techniques. We consult with paleontologists to ensure that all Gaston Design skeletons are accurately reconstructed. All of our casts are hand-cast and colored in the United States. You won’t find better quality and attention to detail! Paleoclones a new fossil casting organization offering over two hundred species of dinosaurs, mammals, trilobites and more. PaleoClones specimens range in size from tiny trilobites to a forty foot long life-size Tyrannosaurus rex skeleton! Each fossil replica is finely detailed to match the original specimen. PaleoClones’ ultimate mission is to increase natural history education in people of all ages and backgrounds. We are working closely with schools, museums and fossil clubs to this end. Stygimoloch was a small pachycephalosaur whose thick skull bristled with bony knobs and spikes. It undoubtedly engaged in head-butting, either for defense or to establish a pecking order during mating, or perhaps both. Its name derives from the river Styx (“stygi”) and the name of a Semitic god, Moloch. In Greek mythology, the Styx was a mythical river flowing through the underworld near Hades (Hell). Stygimoloch’s remains were discovered in the Hell Creek formation of Montana and Wyoming. According to myth, children were fed to the god Moloch. However, even if there had been any youngsters around in the Cretaceous, they would have been in no danger of being eaten by Stygimoloch since it was a vegetarian. Currie, P.J., and K. Padian, (eds. ), 1997, “Encyclopedia of Dinosaurs,” Academic Press, 869 pages. This book is a good encyclopedia of information, current ideas on dinosaurs in one encyclopedia. Topics are short but at least give you information on many ideas and information that current for the field of dinosaur study. Glut, Donald, 1997, “DINOSAURS: THE ENCYCLOPEDIA,” McFarland,1076 pp. Of the three listed this book is number one in my collection because it contains information about every dinosaur known as of 1997. So if you are looking for information on a well known or an obscure dinosaur for your research then this book should be number one on your list of references to check! This is probably the biggest number of questions I am asked. Teachers and students alike: I will not do this kind of research for you, you need to find a source for this book yourselves. While I would love to have the time to provide some of the data found in this book you do not learn something if I type it in for you. If you can afford it (it is $150) I recommend you add it to your own personal library. If not perhaps you can get your local public library to purchase a copy – this should be the number one dinosaur reference in their collection. Farlow, J.O., and M.K. Brett-Surman, (eds. ), 1997, “The Complete Dinosaur“, Indiana University Press, 752 pages. Next to the second reference above this is a must in your own reference collection. This is a well written book at the general level that covers all current topics and areas of knowledge in the dinosaur field of science and what is known about the various groups of dinosaurs. Weishampel, D.B., P. Dodson, and H. Osmolska (eds. ), 2004, “The Dinosauria,” University of California Press: Berkeley. 861p. Simply put, the definitive text on dinosaurs. Now out in a second edition (December 2004) this is probably your most important reference and a must have. When the The Dinosauria was first published more than a decade ago, it was hailed as “the best scholarly reference work available on dinosaurs” and “an historically unparalleled compendium of information.” This second, fully revised edition continues in the same vein as the first but encompasses the recent spectacular discoveries that have continued to revolutionize the field. 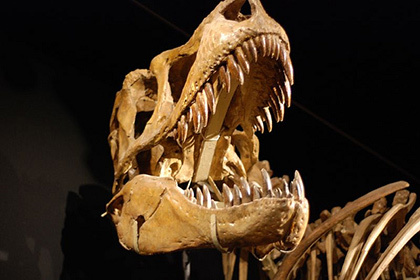 A state-of-the-science view of current world research, the volume includes comprehensive coverage of dinosaur systematics, reproduction, and life history strategies, biogeography, taphonomy, paleoecology, thermoregulation, and extinction. Its internationally renowned authors-forty-four specialists on the various members of the Dinosauria-contribute definitive descriptions and illustrations of these magnificent Mesozoic beasts. The first section of The Dinosauria begins with the origin of the great clade of these fascinating reptiles, followed by separate coverage of each major dinosaur taxon, including the Mesozoic radiation of birds. The second part of the volume navigates through broad areas of interest. Here we find comprehensive documentation of dinosaur distribution through time and space, discussion of the interface between geology and biology, and the paleoecological inferences that can be made through this link. Illustrations: 330 line illustrations, 28 tables. Available from Amazon.com click here. This collection is always under construction so the listing is not complete. It contains some of the better images collected. 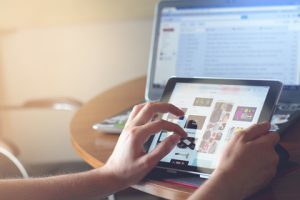 While the material here is not unique to this site, it is being provided freely as a service to those who find it difficult to make connections with other sites. We’re always on the lookout for additional images so feel free to email them to me or point out where I can find more images. Thanks! Unless otherwise noted these images are ones freely available on the web. In the spirit of offering free educational material on the internet the Dino Russ offers these images for your personal use. However, the Dino Russ does not hold the copyright on any of these images (unless noted) and thus cannot give you permission in any way, shape or form, to use these images in any publication, either electronic or hardcopy. If you are wanting to use any of these images you will need to track down the original source in order to seek permission for use. In order to avoid any possibility of infringing upon the person or organization holding the copyright, we request that you seek out the original copyright holder and give them credit for any of these images which they allow you to use. Please do not give us credit for images which others made! Even if you cannot find the original holder of the copyright for a given image we do not want to take or be given credit for such images. If the source of the image is known I have indicated where the image was found. You will need to start there to seek permission to use these images in publications. Some of these images came from other web collections and had no indication of their original source. Are you interested in participating in a real dinosaur dig? Do you want to learn more about the discovery of new specimens? Do you want to share in the thrill of discovery of fossil treasures? Are you interested in the techniques employed by vertebrate paleontologists to remove dinosaurs and other vertebrate fossils from the field? Do you like outdoor work? Do you like strenuous conditions as well as painstaking and tedious work? If you do, you have a chance to participate in a real dinosaur dig. You can find information how you can join a dig, such as excavating a stegosaur bone bed with 4 or more individuals represented. 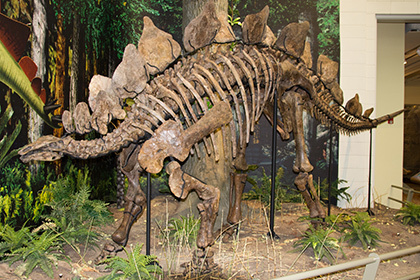 Stegosaurs are very rare, usually found as only one single individual. Brought to you by SN Science Toys and Equipment. Paleontology is a rich field, imbued with a long and interesting past and an even more intriguing and hopeful future. 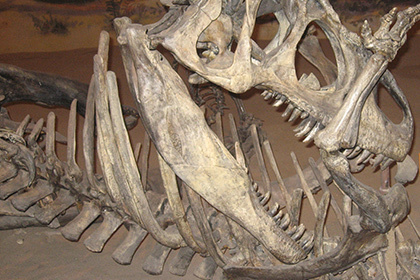 Many people think paleontology is the study of fossils. In fact, paleontology is much more… In short, paleontology is the study of what fossils tell us about the ecologies of the past, about evolution, and about our place, as humans, in the world. 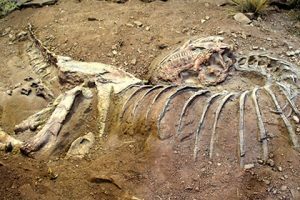 Paleontology incorporates knowledge from biology, geology, ecology, anthropology, archaeology, and even computer science to understand the processes that have led to the origination and eventual destruction of the different types of organisms since life arose.